Andy Murray's hip injury has dealt him the biggest blow yet as the Scot was forced to withdraw from Wimbledon on the eve of the tournament. Murray’s team were waiting as long as possible before making the decision but in the end, they have decided not to risk Murray’s long-term prospects by making a premature return to the courts of Wimbledon. Fans of the of the Scottish star would be forgiven for feeling more than slightly perturbed at hearing Murray wouldn't be making a premature return after being out of action for a year. The 31-year old insists he has no regrets after pulling out of Wimbledon but no matter what way you look at it, this is a career-threatening injury and even when Murray returns, it’s hard to see him getting back to the top of the game ever again. Sport can be cruel and career-ending injuries don’t discriminate as Murray is finding out. With the Scot out of Wimbledon, it becomes that much easier to predict the route to the final and who will win. Federer is back and fresh after taking the whole of the clay season off and punters will be enthused about his chances. The Swiss legend is 13/8 to win his ninth Wimbledon title in tennis betting and few would bet against him. The 132nd edition of Wimbledon will be a huge landmark in the career of Novak Djokovic as the Serb looks to come back from two years of injury and disappointment. Djokovic is just behind Federer as the favourite but the three-time Wimbledon champion has a mountain to climb with the odds, in reality, stacked against him. This will be the biggest challenge of Djokovic’s career as he try's to overcome the most adversity he has ever faced. It will be worth keeping an eye on Rafa Nadal given his comments on Federer and his decision to skip the clay courts where Nadal has enjoyed the majority of his success on. Nadal took a few cheeky swipes at Federer saying that he was contradicting himself after insisting he would enjoy the opportunity to play the King of Clay on the red courts of Roland Garros. 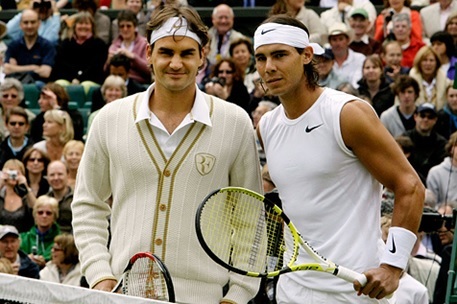 There has always been a bit of needle there between the two greats of tennis and punters can be certain that the Spaniard will be out to win on grass and begin changing the narrative on the greatest of all time. Alexander Zverev may be at odds of 16/1 but punters should keep a close eye on this young player who is on his way to superstardom. The German is one of the form horses and has all the shots in his arsenal to challenge for the Wimbledon title. Murray’s absence at the tournament is a shame for the event and the British public who rally around the Scot during Wimbledon. The hope is that one day Murray will be able to repeat his heroics at the All England Club after making a full recovery. For now, Tennis’ most prestigious grand slam will go ahead without the Scot.